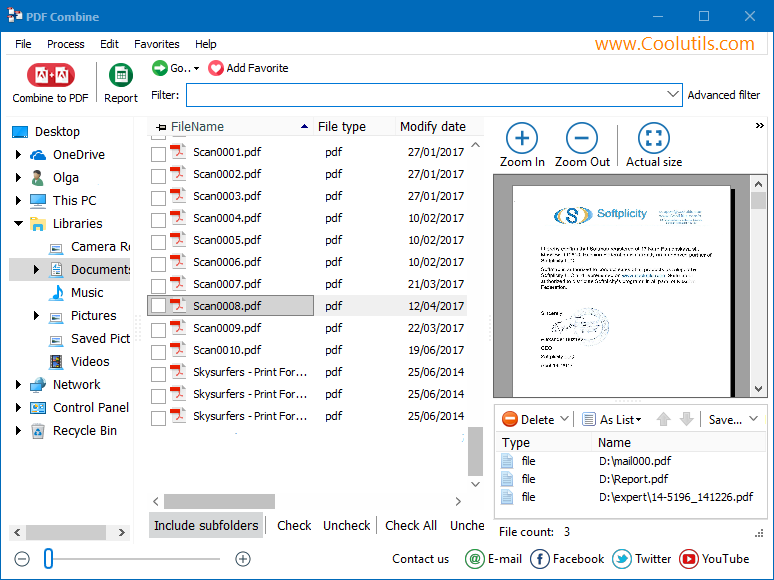 Combine files and folders with sequentially similar names. Keep the original folder structure once you have completed combining them. When using a Windows merge pdf files process, finding the right software application can be difficult. Have you been struggling to merge your pdf files? Resolve your frustration when printing as Windows PDF Combine is intuitive to all printers including duplex type printers. Merging multiple pdf files into one couldn't be easier, making them appear as one document. What's more you can manage them as individual files and folders. Naming files becomes easier as common name attributes are used to name the final file. Most merge products require cloud merging. 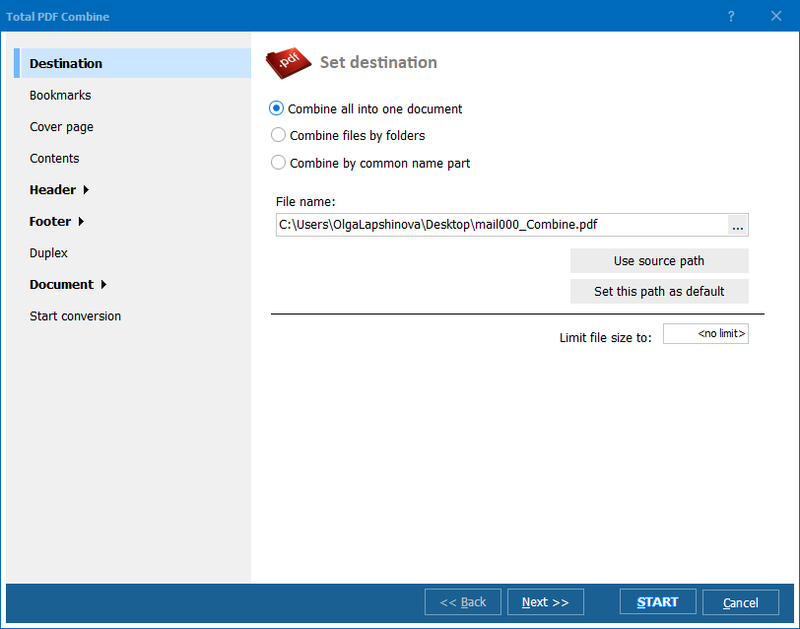 PDF combine allows you to work offline on your PC. No need for expensive applications such as adobe acrobat. PDF Combine is the perfect addition to your desktop. 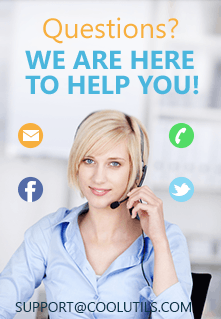 Do you need to combine several pdf files into one? PDF combine will attach all the pdf files together as if they were originally a single document. With all the tools that you need to combine your pdf files in one place, no need to jump between software applications. When you need to combine pdf files Windows, look no further. PDF Combine can save every file name as a bookmark. It is the most convenient way to know what is inside a large multi-page. 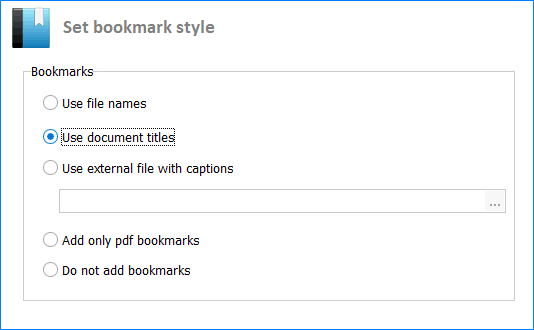 You can click on a bookmark to jump to a particular file. If you combine chapters of an e-book, you can add your own bookmark names. Write them to a simple text file and the program will apply it to the final document. Also, PDF Combine will automatically create a Table of Contents for your resulting PDF. All combined files will be clickable links. It makes the navigation within the multi-page PDF a breeze. You can even customize the look and feel of your table. Download PDF Combine and install it following the instructions. 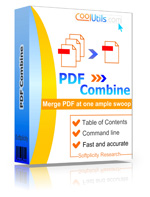 Open PDF Combine on your desktop and select the pdf files that you want to combine. Arrange them in the order that you need them. Drag and drop files or click Up and Down arrows. Press the Combine to PDF button in the top left corner. This will open the settings in the wizard. The wizard guides you through. If you wish to add a header or a footer to each page this is where you will do it. Once you're sure of your settings click on Start button and the app will merge PDF files Windows. "PDF Combine is a fantastic product. I've just combined 152 files across 76 folders, into 76 files in the order I wanted them, whilst maintaining the folder structure, and all in under a minute. This product is going to save me hours and hours of work. Many thanks."